Defying the conventions of rainwear, this model is the epitomy of lightweght and compactness. 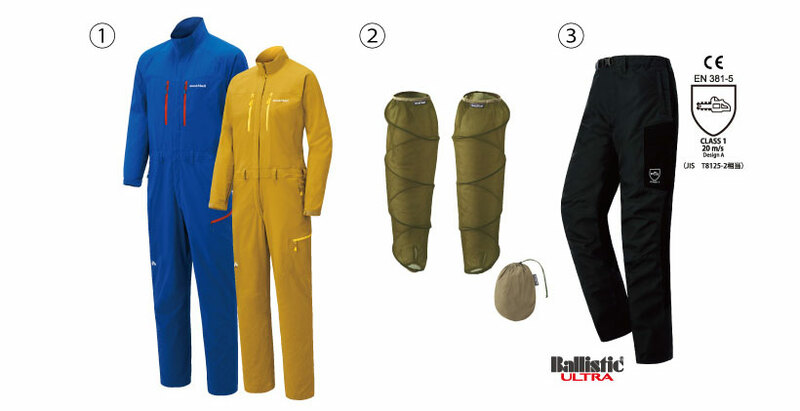 Made with Goretex Windstopper Fabrics which boasts excellent breathability and an ultrathin shell material. Features both excellent water resistance and detail-orientated weight reduction measures. 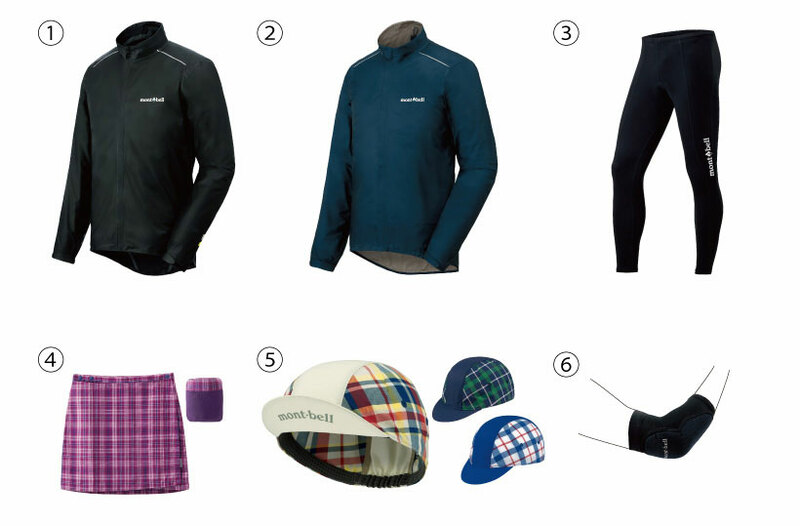 Also includes features necessary for comfort in a rain piece, such as the Tri-Axial Hood for adjusting fit. 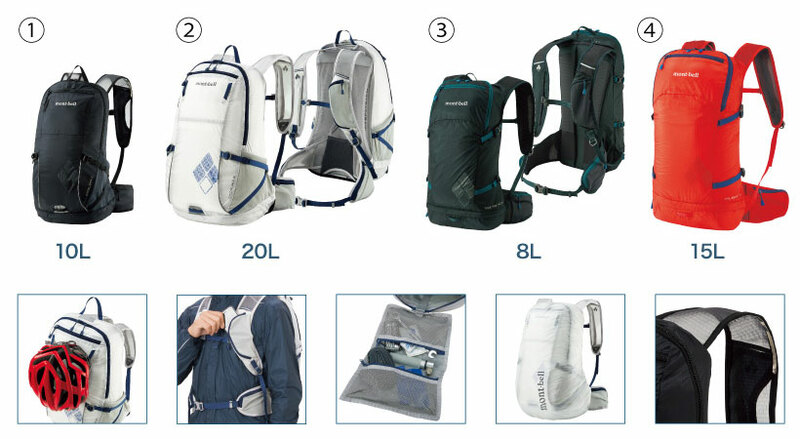 Perfect for a variety of situations including mountain climbing where each gram of weight counts, and ultralight hiking. Cut from a single piece of fabric, K-MONO CUT drastically reduces the amount of seam lines eliminating areas where water can penetrate, promoting the jacket to be lighter and durable. This innovative pattern is based on Montbell's philosophy of "Ki-no-bi" which is a Japanese term for "Function is Beauty". WATERPROOF: Reducing the amount of seam lines eliminates areas where water can penetrate the jacket. LIGHTWEIGHT: Minimizing the amount of seam lines and tapes reduce the jacket's final weight. DURABILITY: Limiting the amount of seam lines around the stressing shoulders and hips improve the jacket's durability. This lightweight model includes a good balance of the features you need for comfortable rainwear. Combines Montbell's proprietary waterproof breathable material and lightweight shell material with dry lining technology that minimizes clammy sticking and dries quickly. Weight reduction measures include Smart Sewing and minimizing sewn parts. Not only can the Rain Trekker be used as a rain shell, but works excellently as a windbreaker and as an additional layer for warmth. The unique design of this rain hat is based on the shape of traditional Japanese headwear. Space at the top of the hat reduces humidity around the head, and the attached chin strap ensures the hat stays in place, even in the wind. Made from waterproof materials, and features an inner core which helps maintain its shape. 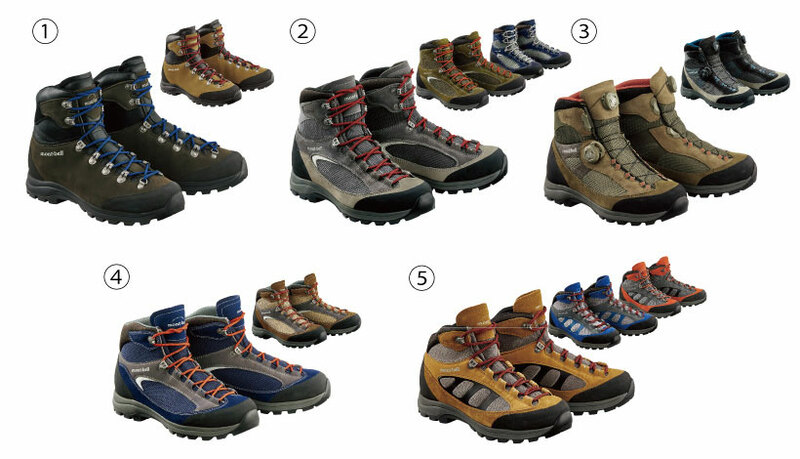 These all weather boots are suitable for long-distance hiking with heavy packs and winter trekking with light snowfall. The upper combines highly durable 2.2mm nubuck leather with Gore-Tex fabric, and features a single seamless leather layer wrapping the toe to provide a firm hold, durability, and excellent waterproof breathability. Designed for both soft comfort and an excellent feeling of stability, enabling smooth foot movement. These high cut all-weather boots are suitable for summer long-distance hiking and trekking. This model has a larger foot circumference that corresponds with a wide 4E size for those with broad feet or a high instep. The stable, soft and comfortable design allows for smooth foot travel. The upper features supple and wear resistant Gore-Tex fabric mesh, which provides world class waterproof/breathability. Reinforced with highly rigid, 2.2mm thick high quality nubuck leather and suede leather. These high cut all-weather boots are suitable for summer long-distance hiking and trekking. Equipped with the Reel Adjust System at the instep and ankle for easy on and off and an excellent fit. The upper features supple and wear resistant Gore-Tex fabric mesh, which provides world class waterproof/breathability. Reinforced with highly rigid, 2.2mm thick high quality nubuck leather and suede leather. These mid-cut all weather boots are suitable for lightweight hiking and hikes with cabin stays. The upper features supple and wear resistant Gore-Tex fabric mesh, which provides world class waterproof/breathability. Reinforced with suede and synthetic leather to reduce lateral movement and provide a stable fit. These lightweight and soft all-weather boots are easy to wear for lightweight hiking and hill and field walks. The upper features supple and wear-resistant Gore-Tex fabric mesh, which provides world class waterproof/breathability. Reinforced with 2mm thick suede leather for moderate rigidity. Metal parts have been removed from the flex line to achieve a lighter weight. n order to increase the amount of living space outside the tent, the front door can be pitched as an awning and inside of the tent also offers a spacious area for sleeping. Light weight and compact, this tent is easy to set up with our unique pole system. Recommended for family camping, car camping and also small enough for bicycle touring. Stuff sacks for the tent, pole, and peg are included. A three-season (spring through fall) single wall construction in a freestanding domed shelter that is world-class in its light weight and compact size. Use of inner poles allows for the shelter to be lightweight and create a comfortable interior space. The floor and key stitch points are outfitted with seam tape for enhanced water resistance. This self-standing dome tent uses two poles and offers plenty of living space. Provides excellent wind resistance while remaining lightweight. This incredibly comfortable flagship model has excellent heat retention and is very lightweight. This model is suitable for use in a wide range of winter climbing situations at most 2, meter-high Japanese mountains. This incredibly comfortable flagship model has excellent heat retention and is very lightweight. This highly versatile model can be used in a wide variety of mountain climbing activities during snow cover, such as winter climbing and mountaineering. This incredibly comfortable flagship model has excellent heat retention and is very lightweight. This model offers a perfect balance of features for year-round use, from summer stays in alpine regions to winter camps in the lower mountains. This sleeping bag cover is lightweight and compact. Protects the sleeping bag from water and releases heat and moisture from inside the sleeping bag due to the breathable nature of the material. Cannot be used by itself and must be used with a sleeping bag. This insect net is used to cover sleeping bags. The fine mesh prevents small insects from entering, which is useful for sleeping under a tarp or in other open air environments. 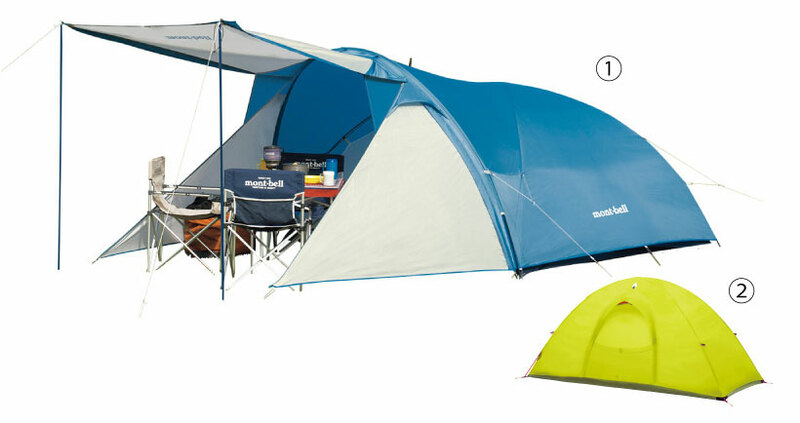 Its pop-up style makes it easy to set up, and is compact when packed. This air pad is ultra-compact when packed down and provides excellent warmth retention and comfort. Comfortable when sleeping flat or turning in your sleep. This wide, square model provides plenty of room for even solidly built outdoor enthusiasts. Lightweight boots ideal for stream climbing. Mesh base on the upper provides good drainage, and resin reinforcement prevents lateral movement inside the shoes. Soft, fitted chloroprene rubber at the ankle does not hinder movement when going upstream, and is easy to put on and remove. Protects against sand and gravel entering the shoe. Aqua Gripper? is used for the outsole, which offers excellent grip even in wet, rocky areas. Ideal for technical routes that involve significant amounts of rock climbing. This stream climbing sock is made with ultra-thin, 0.5mm thick chloroprene rubber. Provides moderate warmth retention for seasons when the water is cold, and features flat seams for improved comfort. These split toe type socks can be combined with Sawer Shoes and Sawer Tabi. Made with a stretchable material that doesn't absorb water easily, for comfortable, stress-free fit. Ideal for water activities such as kayaking and snorkeling. Featuring a gorgeous printed pattern, this item can be worn alone, under paddling wear, or in the pool. Includes removable cups. 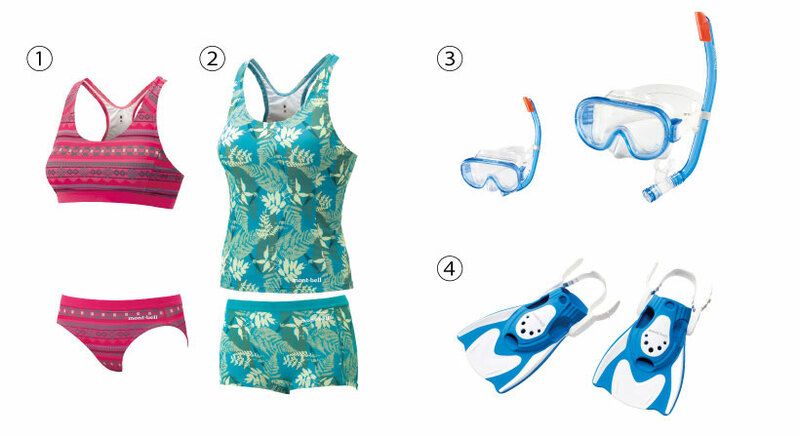 This mask and snorkel set is perfect for snorkeling in rivers or in the ocean. The mask's lens is a large, single type made with tempered glass for minimal distortion due to water pressure. With excellent fit and operability, this set is easy to use even for beginners. The mouthpiece of the snorkel is made with a soft silicone rubber with minimal odor, reducing fatigue even over long hours of use. Snorkeling fins perfect for water or river recreation. With an easy to use short blade, the fit can be adjusted with one touch. Lightweight and compact, these fins are easy to carry with you. KAMI-ITO, paper yarn in Japanese, is made out of Mitsumata Kouzo, or Hemp paper, slit and twisted into yarn. KAMI-ITO has long been made and is recently receiving attention again as an eco-friendly material. For KAMI-ITO, Montbell uses a sustainable fast growing Manila Hemp, which is cropped in 2-3 years and has a low impact on the environment. Montbell's KAMI-ITO PLUS™ fabric balances the Manila Hemp made paper yarn and cotton to achieve superior comfort, breathability, moisture absorbency and lightweight. An excellent material that allows comfort and coolness even during the hottest seasons. Buttons are made from bamboo for a natural and smooth texture. KAMI-ITO, paper yarn in Japanese, is made out of Mitsumata Kouzo, or Hemp paper, slit and twisted into yarn. KAMI-ITO has long been made and is recently receiving attention again as an eco-friendly material. For KAMI-ITO, Montbell uses a sustainable fast growing Manila Hemp, which is cropped in 2-3 years and has a low impact on the environment. Montbell's KAMI-ITO PLUS™ fabric balances the Manila Hemp made paper yarn and cotton to achieve superior comfort, breathability, moisture absorbency and lightweight. An excellent material that allows comfort and coolness even during the hottest seasons. This beret is comfortable to wear even in the hotter weather. Retains its shape and is easy to adjust size with a velcro tab on the inside. Breathability and UV protection makes this parka perfect for protecting your skin from the sun when worn over a shirt or other top. Its hood and sleeves provide cover all the way to the back of the hands to effectively shade from the sun. Features a convenient pocket for carrying small items. Aloha shirt with a dry, non-clingy texture for a refreshing feel. Rigid enough to prevent wrinkles, this shirt is perfect for travel. Choose from an assortment of designs based on nature and outdoor activities. Buttons are made from bamboo for a natural and smooth texture. Illustrations by artist Yammie. The colorful design consists of kayaks. This lightweight skirt can be worn two ways, as a long skirt or dress. Change the length to suit your height by altering the length of the waist. 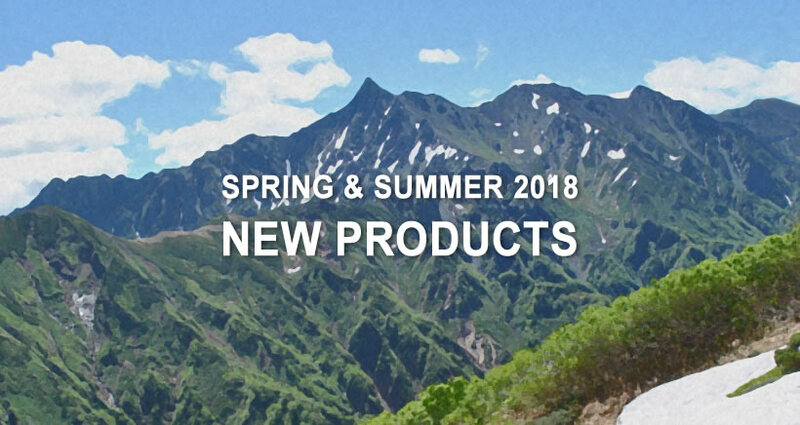 Stretch fabric offers excellent wicking, antibacterial, and odor resistant properties, making it perfect for a variety of activities such as trekking, camping, and relaxation. Two options in print and plain colors available. With a length designed for free leg movement, this item comes with useful features for running, including a coin pocket and reflective tape. Made with a wicking, breathable fabric that keeps you cool and comfortable even during vigorous activity. This lightweight backpack for road and cross country cycling has a streamlined silhouette and low air resistance. A close fit to the body means this backpack stays securely fitted, even when riding hard. Includes a variety of useful features such as easy access pockets and a tool pouch. This lightweight backpack for mountain biking stays securely fitted, even when riding hard. A textured back panel and breathable shoulder straps helps you stay cool and comfortable when wearing. Made with lightweight and durable materials, this backpack comes with a variety of useful features such as a helmet holder and tool pouch. This front model ensures your safety during night rides and charges via USB. It attaches with a band that can fit around wide frames, and can be mounted with one touch. This USB charging model maintains brightness for a certain time even if the battery is low. Equipped with four light modes. The cycle light series ensures your safety during night rides. It attaches with a band that can fit around wide frames, and can be mounted with one touch. This item is a tail light model that charges via USB. Offers good visibility at the sides and features five light modes. This model is made with a unique fabric with a waterproof/breathable membrane on the outside of the shell. Non-absorbent fabric ensures continued comfort. Extremely high moisture permeability prevents any unpleasant humid feel. Gore Windstopper Products With Water Resistance combined with an ultrathin shell material for astonishing lightweight compactness. Every detail has been carefully considered with the goal of weight reduction, including the use of Smart Sewing and narrow seam tape. With all the functionality required for cycling in bad weather while being compact enough to carry with you, this item is perfect for a variety of cycling situations. These lightweight long tights provide excellent protection against UV exposure and sunburn in hot weather. Made entirely with a breathable stretch fabric for a comfortable feel. Features highly functional built-in pads with outstanding cushioning, stretch, and breathability. Printed with a reflective logo on the front left thigh and the right calf for improved visibility to cars. This wrap skirt can be worn over tights when not riding. Compact and pocketable, you can quickly put this skirt on when dropping into a store or restaurant while touring. This cap is made with cool, quick drying and breathable material. Can be worn under a helmet and is suitable as a layer for absorbing perspiration. Wear it by itself as a comfortable cap to help reduces UV exposure. These guards for mountain biking cushion against the impact of a fall and protects the elbow and knee from abrasion. Their unique design keeps them secure even when riding hard. Padded with chloroprene rubber with punch outs, which reduces the build up of heat and moisture. Easily washable. Drawing on our knowledge of functionality and materials used for mountaineering and alpine clothing, we’ve designed these protective pants for forestry work. The surface material is our proprietary Ballistic® Ultra, which is lightweight and highly durable. The front, which may be exposed to chainsaw blades, contains a special protective textile. The back features an elastic material, with a bias cut on the knees and gusset at the crotch, offering outstanding range of motion. In spite of offering a range of features, these logger pants remain lightweight and offer superior comfort. This highly waterproof bag efficiently stores your first aid kit so that it's ready in case of emergency. When unzipped, the bag itself becomes a tray so that treatment can be done quickly on the ground without contaminating the contents. Features interior pockets for storage and organization. This lightweight and simply-designed duffle bag comes with casters. Our unique low-profile handle design eliminates irregularities on the inside to ensure a flat, easy to use internal space. Made from lightweight and strong materials, this bag comes with many user friendly features that allow you to smoothly carry a lot of gear. You can use your smartphone even while stored inside this highly waterproof pouch. Both sides are transparent, allowing you to take photos. Features a loophole for attaching a strap. This travel case allows you to organize and carry your passport and cards. Made with highly durable and lightweight materials. Perfect for when you want to travel as light as possible.